"TapEasy" is a unique tapping machine with an articulated arm. This unique feature helps in tapping a hole anywhere within the prescrbed area. This machine is having a range to tap holes up to 3/4" or M 20 in steel and 1' or M 24 in aluminium. "TapEasy" controls of a specially designed arm carrying pneumatic reversible motor which will tap through holes as well as blind holes. 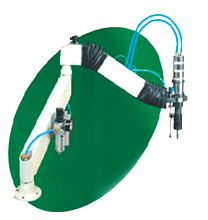 "TapEasy" is available in three models with various arm lengths to suit to your equipments. This is a customer friendly feature incorporated to assist the operator to adjust the force he has to apply while locating the tapping head in line with the hole. This facilates operator for easy forward / reverse operation of motor with simple 'twist'. This helps in holding various tap holders firmly and saves time in changeover. This mechanism has been categorically incorporated to tap blind holes as well as to tap holes at presents depth. This special feature helps in avoiding tap breakage as well as thread damage. 800 x 800 x 850 (LWH) provided with reaching castors. 700 x 700 x 800 (LWH) provided with reaching castors.